Night of the Generals (this is based on recollections of by no means absolute accuracy) featured Omar Sharif in the role of a German criminal investigator during World War Two. What matters for the present comparison is Sharif's unshakable determination to solve the murder case to which he has been assigned: he is ascertaining the identity of a single high-ranking murderer while, around him, Europe collapses, bombs fall, populations perish or are displaced, millions are exterminated, and the enemy closes in. None of this matters, only the case. Imagine this single-mindedness in the context of the accelerated future-historical narrative of an SF novel like Schismatrix: centuries pass, the human species is transformed over and over again, vast technologies flash by the reader with ever increasing exoticism, but a murder investigation, unexceptional in itself, goes on and on.... Such a vertiginous detection is the substance of Watching Trees Grow; and the experiment succeeds rather well. The suspects are for the most part members of the emerging technocracy, and their possible motives and ostensible alibis are all subjected to rigorous examination, as in any homicide inquiry. But the victim was a potential immortal, and the death of such a person is regarded with naturally exaggerated horror in Hamilton's scenario; and as the investigator is an immortal himself, he is capable of extremely unusual persistence in his search for the killer. Evidence can be stored for decades or centuries, until technology has become sophisticated enough to analyse it properly; the true perpetrator of the crime can be hunted to other planets and beyond, as the Families' reach grows ever longer. 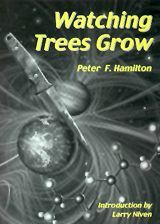 Trees' thriller plot, while compressed into under a hundred pages, extends through astonishing leaps of detective technique, themselves a microcosm of a far more remarkable panorama of relentlessly expanding human capability. Almost anything becomes possible, basic understandings of almost everything change, but still the criminal is pursued with indefatigable commitment. Hamilton's point seems to be that radical transformation is inevitable, but that certain verities--morally, ethically, or culturally relative though they may seem in a posthuman context--must and will remain constant. Watching Trees Grow is a memorable rendition of the sort of sheer cognitive momentum that only SF can truly deliver. It invites expansion, into Hamilton's next great epic. More of Nick's reviews are online at Parsec. fiction by Peter F Hamilton - read an extract from the third volume in the Night's Dawn trilogy, The Naked God; and the short story Softlight Sins. features - read more reviews of Peter Hamilton's work.